ATLANTA - July 23, 2013 - The first compressed natural gas (CNG) fueling station developed under the Atlanta Gas Light (AGL) CNG Program is now open in Valdosta, GA. Approved by the Georgia Public Service Commission (PSC) in 2012, the program is designed to expand public access to the CNG fueling infrastructure throughout the state and enhance Georgia's role in the emerging CNG market in the southeastern U.S. Built and maintained by Langdale Fuel, an affiliate of The Langdale Company, the new station is the first of five CNG stations awarded contracts to go into service under the AGL CNG Program. The station will offer public access to CNG fuel for transportation vehicles, adding two fueling islands to the company's existing service station located at 1628 James P. Rogers Drive. "Our goal in creating the AGL CNG Program was to incentivize station owners, fleet owners and vehicle manufacturers to invest in Georgia and bring the benefits of clean natural gas transportation to the state," said Scott B. Carter, senior vice president of commercial operations for AGL Resources. Langdale Fuel is the first of three commercial operators awarded funding under the special program to open a station. AGL's investment in the Langdale Fuel station was approximately $1.2 million. AGL also has a contract with the City of Atlanta to develop two CNG stations in the city. 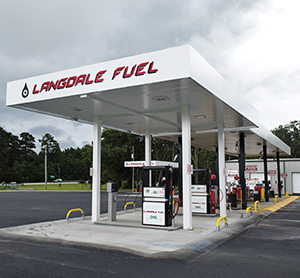 "Valdosta's proximity to I-75 and its strategic location between Atlanta and Orlando make it a key fueling location for fleets and interstate trucks," said Trey Bordelon, Langdale Fuel General Manager. "Having access to capital from the AGL CNG Program made our entry into this emerging market an easier decision and allows us to meet our customers' total fueling needs." The AGL CNG Program allows AGL to contract with private companies and invest proceeds from the PSC's Universal Service Fund (USF) to support installation of fueling equipment at CNG stations and recoup the investment through PSC-approved rates. AGL has access to approximately $11.6 million from the USF to install CNG equipment at public and limited access stations over the next four years. Station owners must demonstrate the ability to meet minimum annual sales of CNG over a five-year period and sign a contract with AGL to participate in the program. Station owners pay a pre-negotiated rate to AGL for use and maintenance of the equipment and sell the CNG to the public at market-based prices. Another component of the AGL CNG Program is a lease program for homeowners and small business owners to install a home refueling appliance (HRA) to conveniently fuel CNG vehicles when commercial stations are not convenient. Leases are available for $60 per month. Atlanta Gas Light, a wholly owned subsidiary of AGL Resources (NYSE: GAS), provides natural gas delivery service to more than 1.5 million customers in Georgia. In operation since 1856, the company is one of the oldest corporations in the state. For more information, visit www.atlantagaslight.com. AGL Resources (NYSE: GAS) is an Atlanta-based energy services holding company with operations in natural gas distribution, retail operations, wholesale services, midstream operations and cargo shipping. AGL Resources serves approximately 4.5 million utility customers through its regulated distribution subsidiaries in seven states. The company also serves approximately 634,000 retail energy customers and approximately 1.23 million customer service contracts through its SouthStar Energy Services joint venture and Nicor National, which market natural gas and related home services. Other non-utility businesses include asset management for natural gas wholesale customers through Sequent Energy Management, ownership and operation of natural gas storage facilities, and ownership of Tropical Shipping, one of the largest containerized cargo carriers serving the Bahamas and Caribbean region. AGL Resources is a member of the S&P 500 Index.